Currently speakers of Pandunia are counted in tens. It is still a very new language. Learn Pandunia! Speak it with others! Talk about it with others! Write stories or articles, make videos, podcasts, music, etc. Creators of Pandunia began to create a language together first in 2005. Since the beginning the basic idea was to create an evenly global auxiliary language. Many different structures and ideas were tried over the years. The name Pandunia was invented already in 2007 but the language got its "final" form in 2017 – but of course languages evolve all the time! 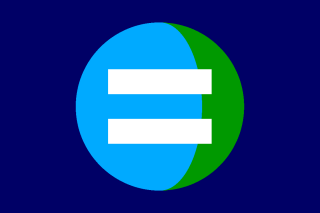 The flag of Pandunia represents global equality. There is a symbol of the blue planet against the background of the dark blue space. The equality sign is laid over the Earth. Platypus (batokrote in Pandunia) is an egg-laying, duck-billed, beaver-tailed, otter-footed mammal that lives in eastern Australia. It is an unusual creature. 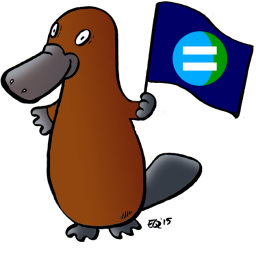 That's why the platypus is a fitting mascot for Pandunia, which is also an unusual mix, a mix of words and grammar from East and West, from North and South. Pandunia doesn't fit into any of the traditional types of languages. Also in that regard it is similar to the platypus, which is of its own type. If your change is a small thing, you should try it in practice with other people and see how it works. If it really is a good change, other people will accept it and use it. Creating offshoot languages is very common in the auxiliary language community. The case of Esperanto is famous. Offshoots of Esperanto are counted in the hundreds but most people haven't even heard of them. Esperanto is still the most popular language of its kind. It is better to have one big language with several dialects than many competing languages. Pandunia has been influenced by both natural and constructed languages. Natural languages with isolating grammar were a useful model. For example the pivot structure comes directly from Chinese. Works of earlier language makers were inspirational. Esperanto, Ido, Novial etc. were closely examined. Latino sine Flexione, Lingua Sistemfrater and Interglossa all have well thought-out isolating grammars. Natural contact languages gave many ideas. It is an interesting observation that when speakers of different languages come into contact, they tend to create extremely simplified grammar to overcome the language barrier — no matter how complex languages they speak natively. The main creator of Pandunia is Risto Kupsala, a Finn who wants to help the world communicate better. People from many countries have helped over the years. A worldlang is a constructed interlanguage that borrows its words, speech sounds and possibly grammar from different language families of the world. There are many worldlangs. Some of them are listed here. The vocabulary of Pandunia is evenly global. It consists of Western (Greco-Latin) words, Perso-Arabic words, Chinese words and Indian words. Many other auxiliary languages use only or mostly Western words, which is not ideal for the world language in our opinion. Internationality is the main criterion for selecting words to Pandunia. All the words of Pandunia are known by many nations in some part of the world. The grammar of Pandunia is concise but very flexible. Pandunia has only a few grammatical structures, which are re-used over and over again. Pandunia is a truly neutral language. It's not meant to imitate any languages, whereas for example Esperanto, Ido and Interlingua are intentionally similar to the European languages. At first Esperanto was an important source of inspiration. However the influence of Esperanto to the final language is insignificant. Pandunia has very different structure and vocabulary compared to Esperanto. Yes. Here are some of the most important lessons to be learned from the history of the international auxiliary language (IAL) movement. Over 99% of IALs do not survive in the long term. Languages that are created without any pre-existing model (so called a priori languages) have very low chance of survival. Languages that imitate and simplify one or more natural languages have some chance of survival. Out of a group of many similar languages only one is likely to do well. Rational reasons do not explain success. The "best" language doesn't necessarily win. Large international organizations, such as the UN or the EU, pay very little attention to IALs. So it is up to grassroots movements to push an IAL to success. Pandunia is not meant to replace English or any other languages. People have ability to speak several languages and they speak every language for a different reason. Some people speak one language at home, another at work and yet another on international travels. We can imagine a world where English and all other languages will continue to be spoken, and where Pandunia is spoken as the universal second language. In a way, English will never be replaced. Those who speak it today will speak it tomorrow. But new generations will grow and they will choose which language(s) they want to speak with each other. So it will be another world with another world language. Maybe it will be English, or maybe a new kind of English or maybe something else. The landscape of languages changes in a natural process. Different languages were spoken in the past and different languages will be spoken in the future. You are free to speak Pandunia, English and any other language that your heart desires. Pandunia follows the phonetic principle. One letter represents exactly one sound, and one sound is written with exactly one letter. Traditionally there isn't any dedicated letter for /ʃ/ in the Latin alphabet. This sound is frequently written by the letter combination SH in English. Other languages use different letters and letter combinations such as CH in French, SCH in German, SJ in Swedish, SZ in Polish, Š in Czech and Ş in Turkish. However, there is a handful of languages that use the letter X for /ʃ/. Basque and Maltese do it without exception. Portuguese and Catalan are less consistent, but X stands for /ʃ/ frequently. Pandunia word xampu' is written almost exactly the same as in Portuguese. It means shampoo. In the Chinese romanization systen, Pīnyīn, the letter X stands for /ɕ/ which is close to /ʃ/. Pandunia has many words with X from Chinese, for example xim, xin and xuxe. Actually there are several languages where C is pronounced like English CH. Some of them are Indonesian, Hausa, Oromo and Rwanda. In Italian, when C is followed by E or I, it is pronounced /tʃ/. This pronunciation is attested in loand words from Italian such as cello and cappuccino. On the other hand, the letter C doesn't stand for any dedicated sound in English. The hard C can be represented by K and the soft C by S. So it makes sense to drop the H from CH. It is unique but not as odd as you might think. In fact, the majority of letters (19 in total) are pronounced in general in the way in Pandunia and English, 5 are different, and two (q and v) are missing from Pandunia. Most letters correspond to approximately similar sounds in Pandunia and in other languages that use the Latin alphabet in their spelling or their standard way of Romanization. The alphabet of Pandunia is compared to alphabets and Romanizations used in other languages in the table below. Letters that correspond normally to approximately similar sounds in Pandunia and in the compared language are listed under SIMILAR. For example English g is considered similar to Pandunia g although there is the 'soft' g (as in gel) besides the more common 'hard' g (as in get) in English. Letters that Pandunia has but the compared language doesn't have are listed under MISSING. Letters that correspond usually to different sounds in Pandunia and in the compared language are listed under DIFFERENT. Different structures were considered and tested during the development of Pandunia. The main choice was between an agglutinating and an isolating structure. In an agglutinating language every word can be clearly divided into component parts. For example Esperanto word "niaj" (our) is made out of three parts: ni- (we), -a- (adjective marker) and -j (plural marker). In an isolating language every word consists of just one part. For example in Mandarin Chinese the word for "our" consists of three separate words: wǒ (first person pronoun), men (plural marker) and de (possessive marker). Then they are simply put together: wǒmende, 我们的. Pandunia is a lightly agglutinating language. It uses separate words to express things like person, number, mood, tense and aspect, which are typically expressed with inflection in agglutinating and inflecting languages. To demonstrate the difference, let's compare the same sentence in Esperanto (a heavily agglutinating language) and Pandunia. Parts of word are separated with the vertical bar sign. Pandunia:  me wol|a   wid|a  ti        dul sundar     yen         zay. I  want to see    your      two beautiful  eyes        now. In many languages, expressions of greeting have something to do with peace, health or well-being. The origins of Pandunia's word salam can be traced back to Semitic triliteral root SLM, which covers a variety of meanings including safety, security, peace and health. Likewise the English word salutation (and French greeting salut) can be traced back to Latin "salus", which means safety, security, health and well-being. So the meaning of salam is greater than the meaning of peace. It means well-being in general and you can use it as a general expression for well-wishing in all kinds of situations, not just when you meet somebody. See the first lesson in the phrasebook for a lot of examples! Pandunia has words in common with almost all languages of the world. About 6500 languages are spoken in the world today. If one word was taken from each language, there would be 6500 words in the dictionary. It sounds like enough, doesn't it? However, it's not so simple. All words are not equal. Some words are more frequent than others. According to the Zipf's law, the most frequent word will occur approximately twice as often as the second most frequent word, three times as often as the third most frequent word, etc. By this rule, only 150 words will account for more than half of everything that is said and written in any given language. The rest, 6350 words, would be more or less rare. Many of them would be hardly ever used! So the value of adding one more source language gets smaller and smaller.